Hi, I am interested in your 2018 Chevrolet Corvette Grand Sport Convertible (stock #100042) listed on Autotrader for $57,500. I'd like to get more information about this vehicle and confirm its availability. 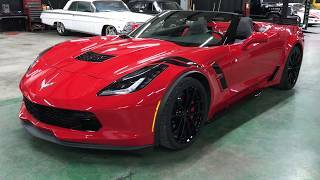 2018 Chevrolet Corvette Grand Sport Convertible 1LT. VIN 1G1YW3D70J5100042. 8,035 miles. 6.2 Liter V8 (460hp). 8 speed automatic transmission with paddle shifter. Clean Carfax, clean title, no accidents, no issues. Meticulously maintained, garage kept. Like-new condition. One owner (bought new and ordered by GM executive). •6.2 liter V8 engine (460hp). We are a licensed and bonded classic car dealer, located in Sherman, Texas. Yes - WE TAKE TRADES. If you have a trade-in, please send photos of your trade, detailed information about your trade and the price you're looking to get for your trade.